Hawaii is the perfect location for a luxury destination wedding. These 8 tips will help you plan the perfect Hawaiian wedding. Have you always dreamed of getting married on the beaches of Hawaii? If so, and you’ve recently become engaged, now is the time to start planning your Hawaiian wedding! Because not only does a destination wedding cost around $28,000 on average, many couples also flock to Hawaii every year to get married. This makes reserving your dream venue a bit more competitive. Then, throw in all the planning of a regular wedding into the mix, and you’ll likely find your head spinning. But never fear. In this article, we’re bringing you 8 tips to help you plan the Hawaiian wedding of your dreams! If you’ve recently become engaged, congratulations! Getting married in Hawaii is a unique experience that few couples around the world get to experience. You may have already decided on a Hawaiian wedding, or you may still be considering it. Either way, it’s important to familiarize yourself with Hawaii’s climate. It’s no secret that Hawaii has gorgeous weather year-round. All year, the water and air temperatures stay above 70?F – on average. The summers are dry and sunny while the winters have significantly more rainfall. There are really no other seasons besides summer and winter. With that said, more couples look to get married in the summer. There’s less risk of bad weather, but couples will likely pay more than those who book in the winter. Before you book a venue and your airplane tickets, decide on the season that’s ideal for you and your partner. A few factors may influence your decision, the first being your budget. How much you’re willing to spend on your wedding will determine whether you get married in the summer or winter. But your budget is not the only thing that matters. The type of ceremony and reception matters, as well. First, decide if you want an indoor or outdoor ceremony. You could have a ceremony on the beach, up in the grassy hills, on a boat, or even in the gardens of a hotel. Then, decide if you want an indoor or outdoor reception venue. We’ll explore how to choose the perfect venue in our next tip. While Hawaii is one of the most beautiful places on earth, it’s also one of the smallest. With all the islands put together, the state is only 10,931 square miles big. In a single year, about 20,000 couples travel to these small islands to get married. This doesn’t include the number of natives who get married in Hawaii, either! It’s a no-brainer to book your venue or vendor as soon as possible. There are only so many days in a season. And there are many other couples who will be looking to get married where you want to. So, how do you choose the perfect wedding venue or vendor? Browse around and explore your options. Do thorough research and don’t hesitate to take reviews into account. What does their availability look like? Do they provide outdoor tents and seating? Once you find a venue that has availability within your desired time frame, book it. It’s harder to be physically involved in the planning for a destination wedding. Consider making a trip where you meet with potential vendors before booking. It’s good to research beforehand to vet out your options. But if your heart is set on a vendor or venue, you might as well book it. Still, you should at least book a trip to see it in person. That way, you can also plan out your decor, catering, entertainment, and flowers. As soon as you get engaged, it’s important that you start to think about your Hawaiian wedding party. Choose your wedding party and notify them as soon as possible so they can start planning and saving. However, compiling a guest list is a bit more complicated with destination weddings. First off, guest lists for destination weddings are usually smaller. Rarely do couples invite more than 30 guests to attend their destination wedding. In fact, many couples only invite immediate family. Think long and hard about who you want to invite to your Hawaiian wedding. Once you have a guest list, give them – at least – 6 months notice. The more notice, the better. Unless you’re having the reception in an air-conditioned hotel, it’s unlikely that you’ll be wearing a traditional gown or tuxedo. The same goes for your wedding party. With a Hawaiian wedding, think light colors and short-sleeves. But your attire isn’t the only thing to take into consideration. If you’re getting married in the summer, you may want to consider pulling your hair up or wearing sandals. In Hawaii, you want to embrace the natural beauty of the land. The best way to do that is to focus on your flower scheme. First, think long and hard about the venue’s setting. What colors are present, and how can you bring those colors out? What types of flowers and trees will surround you during the ceremony and reception? Next, think about your wedding theme or color scheme (if you have one). Flowers may seem like a small detail, but they’re much more significant than you’d think. 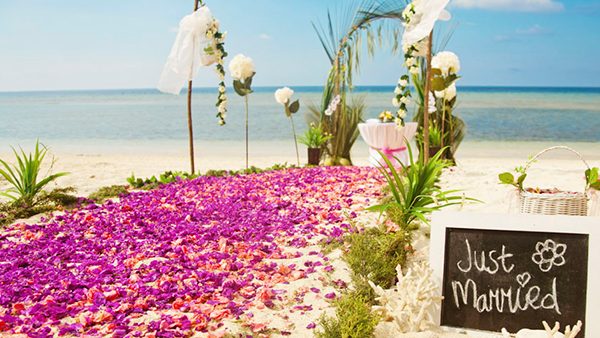 Think of flowers as the final touch to your destination wedding. And since you’re having a Hawaiian wedding, you’ll definitely need leis for all your guests! What should be a happy and exciting time can easily turn the sweetest of brides into Bridezillas. Planning any wedding is stressful. But planning a destination wedding is all the more difficult. But it doesn’t have to be! By staying on top of these 8 tips, you can enjoy planning your wedding in Hawaii. Make your Hawaiian wedding all the more beautiful with fresh flowers that are native to the land. 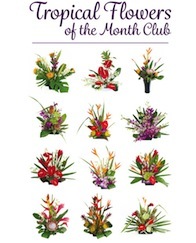 With Our Aloha has everything from orchids to tropical foliage and leis, in all colors and sizes. We’re here to help make your destination wedding in Hawaii a unique and special event. Contact us today! Do You Know When To Give A Gift Basket? 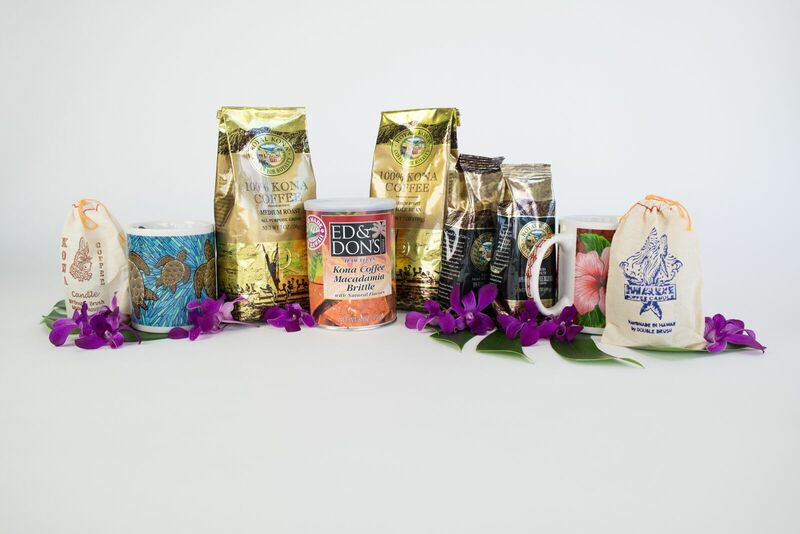 Why not present the friend or family member celebrating a new job, or job promotion with our 100% Kona Coffee Lover’s Hawaiian Gift Bag? They’ll start their new job off right with ground Kona coffee, macadamia nut biscotti, handmade Kona coffee cookies, and a beautiful Hawaiian print coffee mug to hold their coffee while they learn their way around that new job. Help the mom-to-be get a jump-start on managing the stress that comes with adjusting to becoming a new mom with our Stress Release Formula Hawaiian Gift Basket. The soon-to-be new mom will love the feeling of being pampered while she soaks in scented bath water, smooths on deep moisturizing lotion, and enjoys the stress relieving fragrance or our aromatherapy soaps. We use wild flower essences of lehua, yellow ginger and kinehe to soothe the nerves and relax the body. Nothing says “I love you” like surrounding your lady with beautiful and relaxing scents to refill her soul. Our basket, Soul of a Woman does just that. Bath crystals, lotions, body mist and soaps are scented with mango, white ginger, banana and lehua harvested right here in Hawaii to soothe and rejuvenate the soul. Everybody loves chocolate, and our Chocolate Lovers Hawaiian Gift Bag is heaven in a bag. You’ll find chocolate covered macadamia nuts, chocolate chip cookies, chocolate covered Tiki Toffee, and more to pamper your favorite chocolate lover. In a professional setting a simple gift can go a long way in strengthening business relationships. Saying ‘Thank You’ to an important client, employee or mentor makes a big impression. If you are in charge of finding a large number of gifts for a company event, sales rewards or customer gathering consider a Hawaiian theme. We will help you design a gift bag or basket to meet your budget. Contact us to learn about our other gift basket options.